This is the end of the first chapter Of Balakanda of the holy Ramayana composed by Valmiki as the first epic. In the righteous natured virtuous world of the wise , Rama is great and so tell the history of Rama as narrated by Narada. The known and unknown aspects of the story of the learned Rama along with Lakshmana and that of the Rakshasas as well as that of Vaidehi , though it may not have been known earlier would be clear to your mind , and will be revealed to you. This is the end of the second chapter Of Balakanda of the holy Ramayana composed by Valmiki as the first epic. Thus ends the third sarga of the Balakanda which occurs in the first epic composed by sage Valmiki. Sarga(Chapter) 4: The sage after composing the epic entrusts its singing to Lava and Kusha. 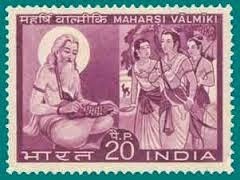 Those two princes who were disciplined and well versed disciples who were solidly based on Dharma , learnt by rote that epic, completely and chanted it as per the instruction of sage Valmiki before the assembly of sages , Brahmins and saints. Thus ends the fourth sarga of the Balakanda which occurs in the first epic composed by sage Valmiki. In the olden times this earth which was completely bounded belonged to the victorious Prajapathi and his descendents. The city of Ayodhya inhabited by Dasaratha had thousands of great warriors termed as Maharadhis(great Charioteers) who were skilled archers with a quick hand, They would never shoot at solitary persons , persons without any defense , those who are fleeing from a battle,. They were sufficiently skilled so that they could shoot at a foe or animal based on sound and had great strength in arms.. They hunted wild animals like lions , tigers and boars with very sharp armaments. Sarga(chapter):6. The kings and people of Ayodhya. The Brahmins in Ayodhya were interested in performing their duties , had control over their senses , were by nature charitable , were self controlled , did self study , accepted charity and their marital relation was confined to their wives. Thus ends the sixth sarga of the Balakanda which occurs in the first epic composed by sage Valmiki. Tiger among men, that Dasaratha guarded his people , pleased and protected the righteous ones by gathering effective intelligence through spies deserted the unrighteous ones and was well known in all the three worlds and ruled well . Thus ends the seventh sarga of the Balakanda which occurs in the first epic composed by sage Valmiki. Thus ends the eighth sarga of the Balakanda which occurs in the first epic composed by sage Valmiki. Sarga(Chapter ) 9 : Sumanthra tells the story of Rishya Sringa and the need to bring him. Thus ends the ninth sarga of the Balakanda which occurs in the first epic composed by sage Valmiki. “Thereafter all of them embraced him with great joy and gave him various items of food as well as many sweet dishes. Thus ends the tenth sarga of the Balakanda which occurs in the first epic composed by sage Valmiki. Reaching the city he saw the son of the sage and best among Brahmins , glowing like fire, seated next to king Romapada . Thus ends the eleventh sarga of the Balakanda which occurs in the first epic composed by sage Valmiki. Hearing the words of the Brahmin, the king was mightily pleased and he spoke these auspicious words to his ministers. Thus ends the twelfth sarga of the Balakanda which occurs in the first epic composed by sage Valmiki. Thus ends the thirteenth sarga of the Balakanda which occurs in the first epic composed by sage Valmiki. The heaps of food which were kept ready for distribution and which looked like mountains were seen everywhere , daily . Well decorated men were seen serving food to the Brahmins and people wearing ornaments and gems assisted them. Thus ends the fourteenth sarga of the Balakanda which occurs in the first epic composed by sage Valmiki. Thus ends the fifteenth sarga of the Balakanda which occurs in the first epic composed by sage Valmiki. Sarga(Chapter) 16 : Conduct of Puthrakameshti , receiving of Payasam. Thus ends the sixteenth sarga of the Balakanda which occurs in the first epic composed by sage Valmiki. “You may create using the body of chief Apasaras and Gandharwa women , yourself in the form of supernatural, brave and intelligent monkeys, who are an experts in illusion, who are equal to wind God in speed, who are knowledgeable of administration, who are as valorous as lord Vishnu, who would complete the job entrusted them, who had knowledge of various tricks of warfare , who can resist all sort of weapons and resembling the devas who subsist on amrita . Vali the mighty armed leader who had great strength protected all of them as well as the bears and cow tailed monkeys. Thus ends the seventeenth sarga of the Balakanda which occurs in the first epic composed by sage Valmiki. Sarga (Chapter) 18:Birth of sons to Dasaratha, their education and coming of sage Viswamithra. When the great king Dasaratha completed his horse sacrifice, the devas received their share and returned to their places. After sending back all his guests , the king with a balanced mind started thinking about begetting sons and living happily. Thus ends the eighteenth sarga of the Balakanda which occurs in the first epic composed by sage Valmiki. Sarga (Chapter) 19 : Viswamithra requests Dasaratha to send Rama to protect his sacrifice. Thus ends the nineteenth sarga of the Balakanda which occurs in the first epic composed by sage Valmiki. Thus ends the twentieth sarga of the Balakanda which occurs in the first epic composed by sage Valmiki. Thus ends the twenty first sarga of the Balakanda which occurs in the first epic composed by sage Valmiki. Blessed by that knowledge Rama , the greatly valorous one , who resembled the Sun God with thousand rays, performed all duties due to the teacher to the son of Kushika , and those three stayed that night with happiness on the banks of Sarayu. Thus ends the twenty second sarga of the Balakanda which occurs in the first epic composed by sage Valmiki. Thus ends the twenty third sarga of the Balakanda which occurs in the first epic composed by sage Valmiki. All those great souls who were doing combined penance, positioned the auspicious boat nearby the shore told like this. Thus ends the twenty fourth sarga of the Balakanda which occurs in the first epic composed by sage Valmiki. Sarga(Chapter) 25. The story of Thatka and her atrocities. Thus ends the twenty fifth sarga of the Balakanda which occurs in the first epic composed by sage Valmiki. Freed from the curse that forest , that same day itself pleasantly shined like the Chaithra ratham forest of Lord Khubera. Thus ends the twenty sixth sarga of the Balakanda which occurs in the first epic composed by sage Valmiki. Lady whose husband is alive.